Richmond, Virginia will be the place to be on August, 28, 2016 if you're a drum geek. Conceived by Monica and Tim Moehring, the founders of Aisthesis Productions, The Shape of Sound promises to be a "drum circle event unlike anything Richmond has seen or heard." 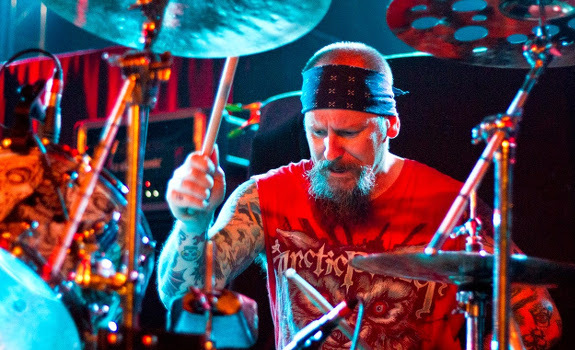 The live musical performance will include more than 30 accomplished drummers, including Richard Christy (Charred Walls of the Damned, Death) and Richmond weirdos Bermuda Triangles at the center of it all. The musicians will be performing an original piece by Dave Witte (Municipal Waste, Deny the Cross) and John Skaritza (Men's Recovery Project, Hose Got Cable). Wanting to learn more about the event, I reached out to Witte to get the lowdown. How did this thing come together? Well, Monica and Tim Moehring of Aisthesis Productions are making a film titled Last Call. Not only is Municipal Waste in it, Richard Christy is as well. Monica knows Richard and I are pals and share a love for good beer, so she was like, "How about doing a drum circle at a brewery with Richard while he's in town after finishing his parts?" The first thing that ran through my head was the thought of a hippie drum circle with hand drums and I wasn't really excited about that. Then after thinking on it for a bit, I proposed a full drum set circle. I've always wanted to do one in Richmond after I was invited to participate in the 88 BoaDrum. That was probably the coolest thing I've done out of all the drumming situations I've been in. How did John Skaritza become involved? 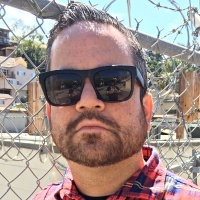 John is a very talented drummer who was in Hose Got Cable, Men's Recovery Project, the Rah Brahs, and a bunch of other stuff. He's a very musical guy, full of creativity. I contacted him right away to get the ball rolling. Tell me about the piece you guys wrote for this. How would you describe it? The initial idea was inspired by 88 BoaDrum. There's no denying the impact it had on me, so I wanted to show tribute and subject other people to a version of it. Then it mutated beyond the 88 blueprint into four sections that we worked out together with the Bermuda Triangles. The Triangles are taking lead in a section with a song of their own that we'll all drum along to. 33 drummers will be playing this piece and we wanted it to be easy to follow, as there will only be one run through of it the morning before the event. It will be a giant percussion pulse and sound huge with everyone working together. What is it about Richmond that you think has made the local music scene so strong these past few years? RVA has always been a hotbed of creativity in all genres. Lots of people come here for school/art school, and many of us play in different bands together, always spawning something new. Richmond is also full of road dogs, we have a lot of touring bands and that's inspiring. This city also has a ton of other things to offer like an amazing food and beer scene. Living here is inexpensive and not too far from major cites on the East Coast, which makes it attractive for working musicians. Will you be dropping any blast beats during The Shape of Sound? There will be sections for people to branch out on their own, anything is possible. 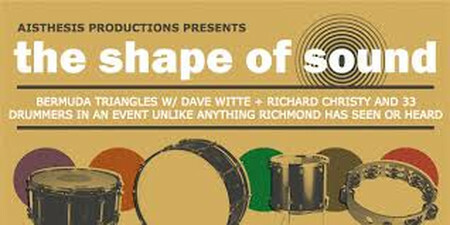 The Shape of Sound will go down on Sunday, August 28, 2016, at Hardywood Park Craft Brewery in Richmond, VA at 2:00pm. Head here for more info on the event.